Missouri Tiger fans know the numbers. 1978 was the last time a Missouri team went up to Lincoln and beat the Nebraska Cornhuskers. The Tigers ranked 3 rd in the country will look to end the slump this Saturday. This is by far the best Missouri team that has gone up there, but let’s not forget, #1 USC, #2 Georgia, and #3 Florida were all upset this past weekend. Head coach Gary Pinkel is very aware of it. Even quarterback Chase Daniel doesn’t have an answer as to why there were so many upsets. You can listen to their comments on the Nebraska game below. On November 4, 2006, when Chase Daniel was a sophomore, the Tigers were down 24-3 and ended up losing 34-20 and lost a share of 1 st place in the Big 12 north. The last time the Tigers won, they pulled off then a 35-31 upset. Phil Bradley was the quarterback, Kellen Winslow, the tight end, James Wilder at running back. Tiger fans are hoping the Chase to Chase QB to TE connection does in the Huskers again. 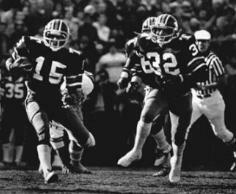 Watch highlights from the 1978 game right here .